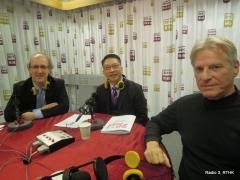 RTHK's Backchat radio programme featured the Secretary for Justice, Rimsky Yuen (LLB 1986; PCLL 1987) on 9 January 2015 to discuss the second phase of the political reform consultation, which runs for two months. Michael Davis and legislator Joseph Lee also spoke on the programme. The presenters were Hugh Chiverton and Danny Gittings (PhD candidate). To listen to the programme, click here. Professor Albert Chen appeared on the programme the day before (8 January 2015), one day after the launch of the consultation. Click here to listen to the interview with Professor Chen.